The first engine that we’re going to dive into is Unity. Unity is an amazingly flexible platform to build a game with, and is my personal favorite environment to prototype new shaders or graphics techniques in. 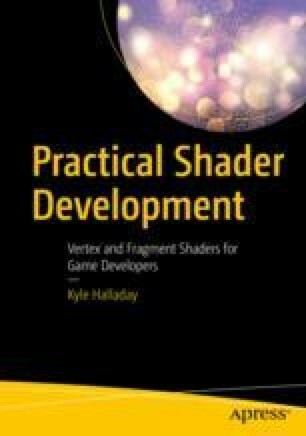 However, Unity is a very complex engine to wrap your head around, and this chapter is not going to provide a ground-up tutorial in how to work with Unity, just how to write shaders for it. If you’d like to learn to use Unity, but haven’t before, I recommend jumping into some tutorials online before trying to tackle the content in this chapter; otherwise you’ll likely be a bit lost. You don’t need to be a Unity expert to start writing shaders for the engine, but you do need to at least be able to navigate the editor and get an object onto your screen.